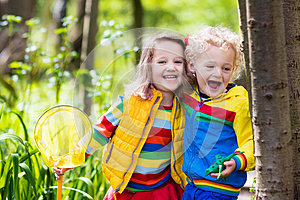 Children playing outdoors. Preschool kids catching frog with net. Boy and girl fishing in forest river. Adventure kindergarten day trip into wild nature, young explorer hiking and watching animals.